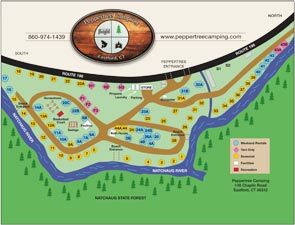 Peppertree Campground is located on Route 198 in Eastford, CT on the sparkling clear Natchaug River. From I-84 Exit 69 - Take Exit 69 onto Route 74 East. At stop sign and intersection take left onto Route 44. Continue on Route 44 East to Route 198 South intersection. Take right onto Route 198 South. Peppertree Camping is about 1 1/2 mile on the left. From I-395 Exit 37 (formally 91) - Take Exit 37 (formally 91) onto Route 6 heading West. Continue on Route 6 for about 15 miles. At the signal light and Junction of Route 6 and 198, take a right onto Route 198 North. Peppertree Camping is about 7 miles down the road on the right. From I-395 Exit 41 (formally 93) - Take Exit 41 (formally 93), heading west on Route 101 toward Pomfret. Route 101 merges into Route 44 West. Continue on Route 44 West to Route 198 South. Peppertree Camping is about 1 1/2 mile on the left.